Sorry but November 8th is too late! November starts the “Christmas” ads that start filling up your daily paper…you can put your weights away and just lift the Sunday paper. I had to laugh yesterday though…I’m not sure I would buy a mattress from Ortho. 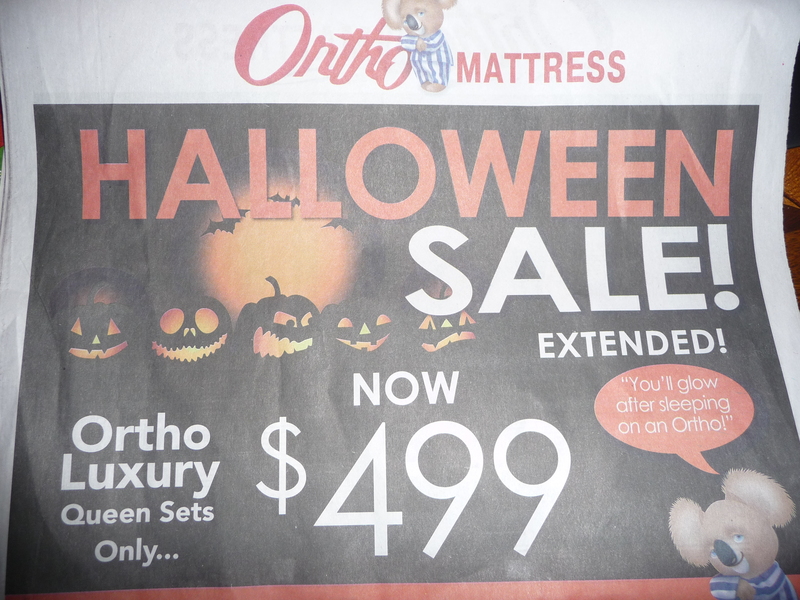 They actually advertised that they were “extending” their Halloween sale and they had pics of jack o lanterns in the ad. I assumed that their entire advertising department was all laid off so this was their desperate attempt at “creativity”. I mean c’mon…do these Ortho people not know that Veteran’s day is this Wednesday. Do they have something against veterans or will that sale be the next weekend? If I was a company this is what my slogan would be – Spend what you can afford. I think that’s awesome! Remember Miracle on 34th Street when Santa would send the customers of Macy’s to Gimbel’s (the competitor) and people then loved Macy’s because it showed “they cared”. Well my slogan says I care. One more note on Sunday’s ads…can you believe at Toys R Us that you can buy Candy Land for $3.99 with a $2.00 rebate. I think Ortho should have had kids playing Candy Land on one of their beds, saying something like – Candy Land, $1.99. New Mattress, $499. Kids being happy…priceless. Oh wait, that’s been done. But it’s still better than an after Halloween sale…LAME.